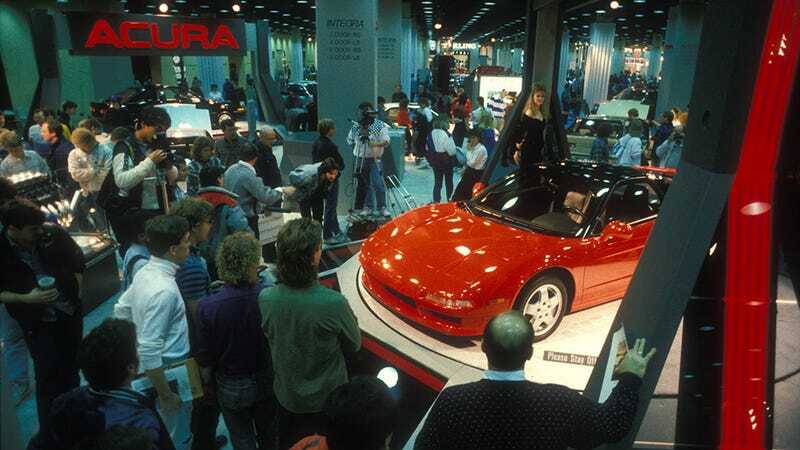 On Feb. 10, 1989, executives from Honda and a newly founded division known as Acura piled into a conference room in Chicago's historic Drake Hotel to rehearse the unveiling of an unbelievable new car—a Technicolor vision for the future, something never before built by Honda or any Japanese automaker. As the public relations department went over its lines, Tadashi Kume, then-president of Honda and an instrumental figure in Honda's Formula One efforts, presided. The people from Honda America were acutely aware that the Big Boss from Japan, Kume, rarely made a stateside appearance unless it was for something serious. Next door, Ford was in the middle of a full-on press conference. Honda kept its rehearsal respectfully quiet. While the executives busied themselves with the presentation, Kume sauntered over to the red-and-black prototype on the stage. He climbed in. Either the keys were already in the car, for one reason or another, or he put them in. The engine sparked to life, then it roared as Kume proceeded to rev to redline—right in the middle of the Ford conference. Everyone was shocked. "Mr. Kume, stop it!" yelled Kurt Antonius, Honda's spokesman emeritus, gesticulating wildly. "They're gonna hear this!" At the unveil the next day, Antonius saw journalists crawling on their elbows and their stomachs, trying to slide closer to the car as Kume spoke, diving under the car to gaze upon the all-aluminum suspension.Journalists packed the same cramped, low-ceilinged room wall-to-wall, their bulky cameras primed for the moment. Kume described one engineering achievement after another: forged pistons…titanium connecting rods… all-aluminum monocoque…and an 8,000 RPM redline, which he had tested the day before… The press kit they received, complete with black-and-white photos, had six pages devoted to the engineering alone. One can only imagine what this sleek-wedged spaceship must have looked like to journalists during the tail end of the 1980s, a time when the future was always tantalizingly close. Perhaps it was like witnessing the debut of the Citroën DS 34 years earlier, watching a car that had "fallen from the sky." Maybe like the Lamborghini Miura chassis on display in Turin just 10 years after that—naked, purposeful, utterly enthralling. 25 years later, we drove the NSX one more time to see if the car really lived up to the hype. That's always the problem with pioneers, isn't it? When something so revolutionary falls from the sky, legions of imitators whittle away its groundbreaking essence, the wheels of progress chip away at its shocking impact, until revisiting it pales in comparison.